The currants are so abundant in my friends garden that I’ve been back several times to pick and there are still more. The red plump berries weigh down every branch and I’ve come to realize a lot will be left for the birds to enjoy. Coincidentally, each basket I use to collect the berries holds approximately 4 pounds of currants which is the exact amount required for this next recipe. It’s really great when all of the ingredients you require are in season and/or at your finger tips. That’s exactly what I realized when I stumbled upon this recipe. 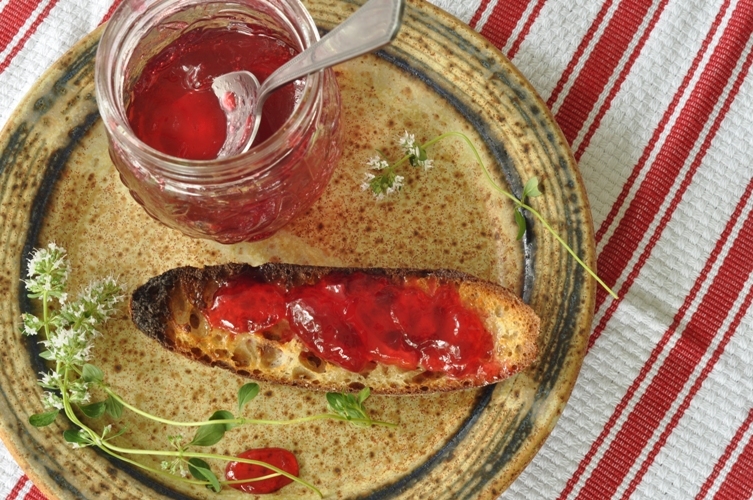 This recipe comes from Christine Ferber’s book Mes Confitures and is an excellent resource with some very interesting jam and jelly recipes. Wash currants well in cold water, drain, and stem the berries. 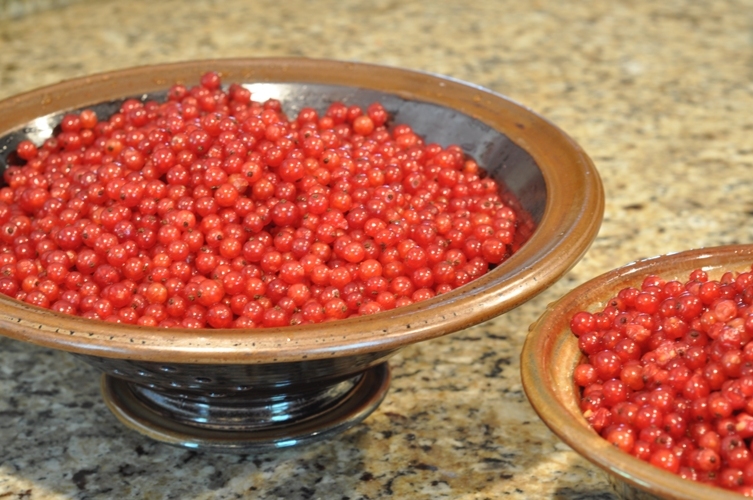 In a large stainless steel preserving pan, add currants and 1 cup of water and bring to a boil over medium high heat. Cover the pan, lower heat, and allow berries to soften for about 5 minutes. 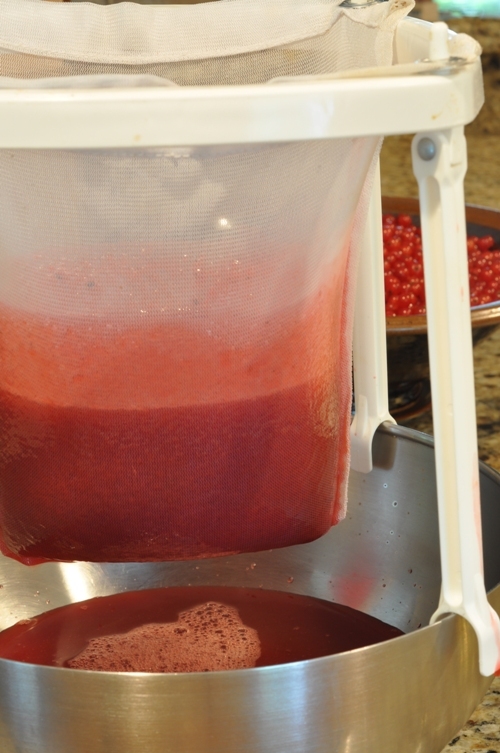 Collect the juice by using a food mill or fine chinois sieve, use the back of a spoon to press the soften berries in the chinois sieve (the food mill method does all the work). Filter the juice a second time through a wet and wrung out jelly bag collecting only the juice. Note: We used our tomato mill to separate the seeds and extract the juice and pulp. But, we also had to filter it a second time to separate the juice from the pulp. 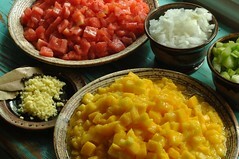 Reserve the pulp to make fruit roll ups and the seeds can be used to flavour vinegar. Rinse lemons well and cut into thin rounds and then quarter. Place lemon slices in a stainless steel preserving pan with 3/4 cup water and 1/2 cup sugar. Bring to a boil. 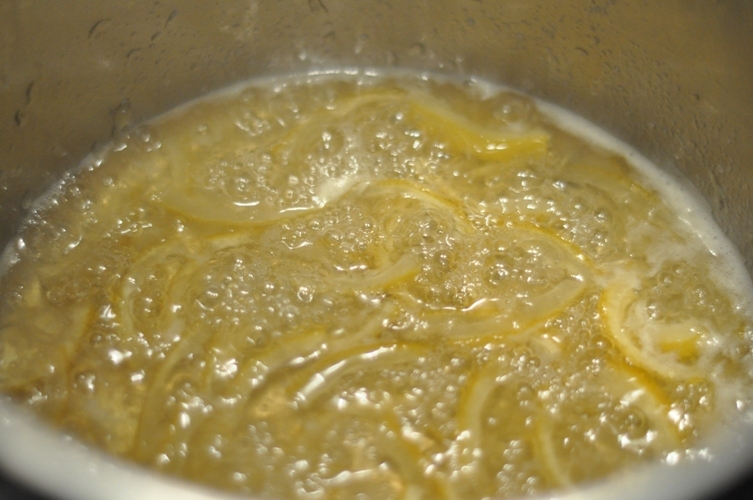 Continue to boil lemons until the slices become translucent (approximately 15 minutes). Add more water if necessary so they do not stick to the bottom. 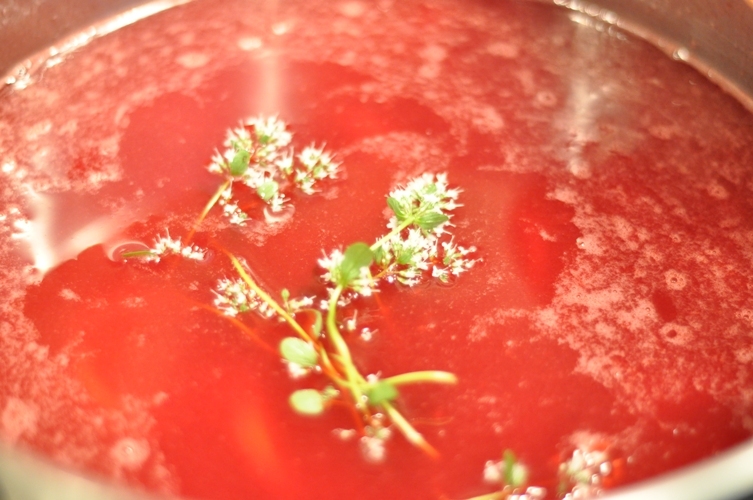 Pour currant juice (approximately 3 cups), sugar, thyme honey, poached lemon slices with sugar-water, lemon juice, and sprigs of thyme in flower in a large stainless steel preserving pan. Bring mixture to a boil and continue cooking on high heat for about 10 minutes. Skim as necessary. 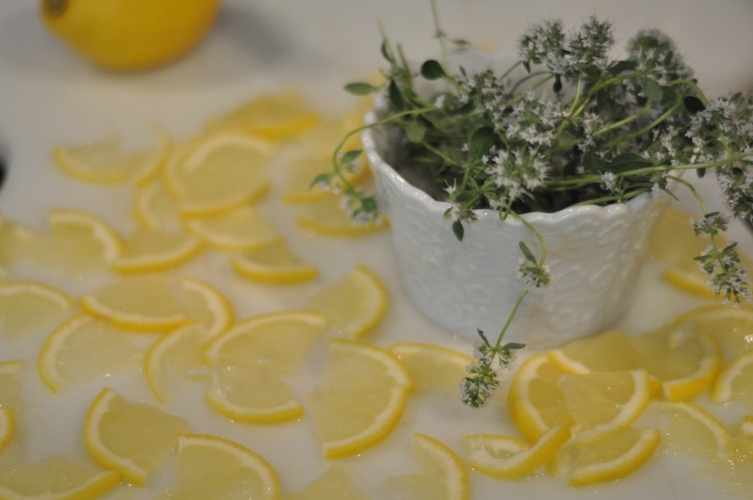 Remove the lemon slices and thyme sprigs with a slotted spoon and reserve to add to each jar. Return jelly to stove and check the set. Add lemon slices and thyme sprigs to each hot sterilized jar. Skim the jelly carefully. Ladle the jelly into each jar, leaving a 1/4″ headspace. Remove air bubbles, wipe rims, place lids and screw bands on adjusting so that they are just finger-tip tight. Process in a hot water bath for 10 minutes. The set of this jelly turned out fantastic (if I do say so myself). I imagine it has a lot to do with the natural pectin present in these berries and the fact I remained calm. Often I either under cook or over cook my jellies but not this time. It’s a sweet, flavorful jelly and the lemon pieces really add to the overall taste by cutting the sweetness (even if they did float to the top). Silly question- could you please tell me what brand your jelly bag is? I know I’ve seen that type before, but now that I want to buy one, I can’t find it anywhere! All I seem to be able to locate are the NorPro metal stands with cotton tie on bags. They always seem to magically untie themselves at critical moments! Thanks! We purchased it from Lee Valley. It is the jelly and syrup strainer and you can buy replacement bags as well. We really like it and the bags clean up well too. Thanks so much! I just put in my order!